Fiat Chrysler is debating various options to reduce weight and boost the fuel economy of the next Jeep Wrangler, moves that could mean the end of Wrangler output in Toledo, Ohio. PARIS -- The next-generation Jeep Wrangler may be built off a unibody platform, feature smaller and turbocharged engines, and switch to an aluminum body, Fiat Chrysler Automobiles CEO Sergio Marchionne said. Yet building the off-roader’s current body-on-frame tub out of aluminum, which is under serious consideration, will mean moving Wrangler output away from its current plant in Toledo, Marchionne told reporters during a press conference at the Paris Auto Show. 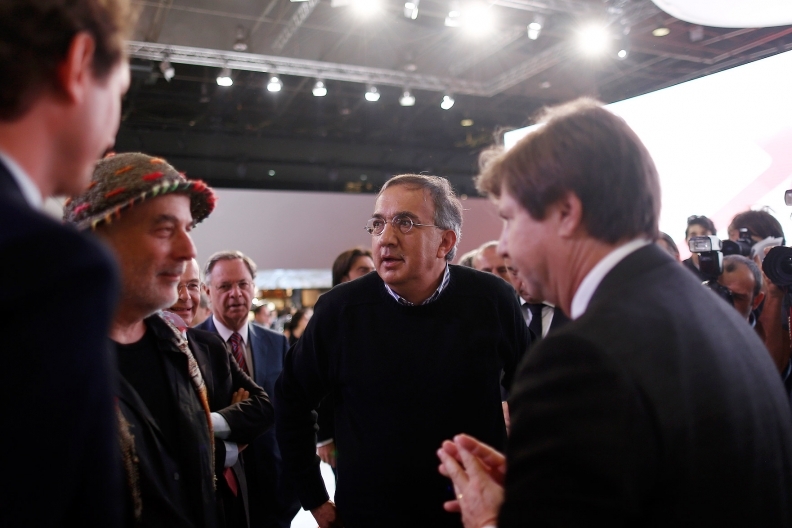 The debates that raged inside Ford about adopting an aluminum body on the redesigned 2015 F-150 pickup “are going on inside our house now,” Fiat Chrysler CEO Sergio Marchionne said today in Paris. As indicated by Marchionne’s remarks, Ford’s decision to embrace aluminum on the high-volume F-150 pickup is being closely watched by rivals. Marchionne hinted that the next Wrangler might switch to unibody construction as he named North American factory alternatives with available capacity. All of the plants he mentioned produce vehicles on unibody platforms. “One of the things that we are dealing with now is what else do we do with Toledo that fulfills our commitment to the city and to Ohio. I don’t have a doubt that there will be zero impact on head count and employment levels and anything else,” Marchionne said. Marchionne’s revelations came in response to a question from Automotive News about the future of the Wrangler and his previous pronouncements that he would not build additional manufacturing capacity in North America. 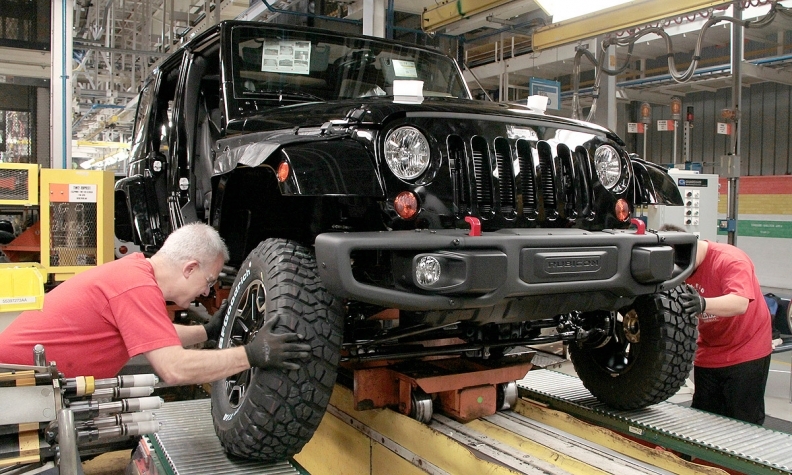 Wrangler production was moved out of Toledo once before -- for a short time in the 1980s to Brampton, Ontario -- when Jeep was owned by American Motors Corp.
Marchionne said development of the next Wrangler is ongoing, yet some things are clear because of FCA’s lack of global resources. 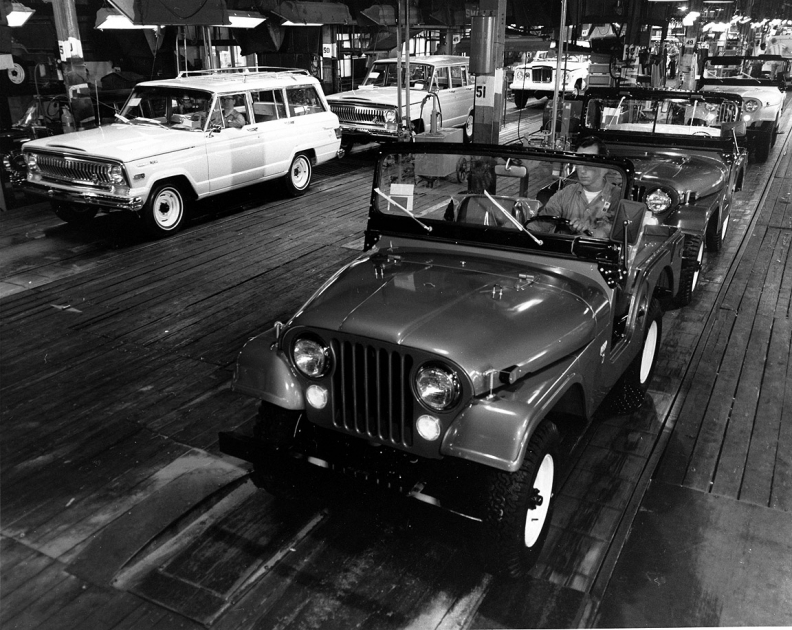 The venerable CJ, right, and other Jeep models roll off the final assembly line at the Jeep Parkway plant in Toledo, Ohio, in 1964. Marchionne’s discussion today of moving Wrangler production from a Toledo factory directly contradicts a statement he made at the Detroit Auto Show in January. Switching to a unibody platform to build the new Wrangler might create what would effectively be a modern-day version of the popular Cherokee XJ, which sold over 2 million units worldwide between the late 1980s and 2001. However, such radical changes to what Jeep brand head Mike Manley constantly calls “the icon of the brand” could be too big a pill to swallow for Jeep’s loyal followers. The Wrangler, the No. 2 seller in the Jeep lineup, is a direct descendent of the original Willys MB, the ubiquitous military vehicle that helped the Allied armies win World War II. It was first marketed as the CJ -- for civilian Jeep -- in the 1940s. The CJ name was used for decades until the switch to Wrangler in 1986. Bruce Baumhower, the president of UAW Local 12, which represents hourly workers at Chrysler’s massive Toledo Assembly complex, said a decision that would move Wrangler production out of Toledo would be a slap to workers who have sacrificed to build record numbers of Wranglers to satisfy demand.